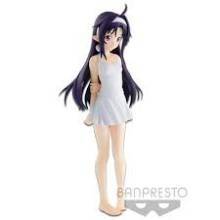 From Banpresto. 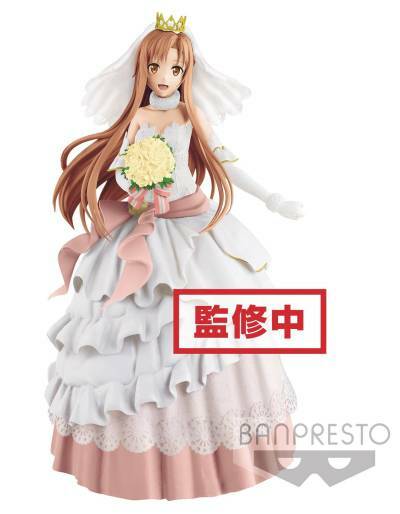 Asuna steals hearts in any game she plays, but she's truly something special in this wedding design from Banpresto's EXQ Figure line inspired by her appearance in Sword Art Online: Code Register. Standing at a height of 9 1/8", she's featured in a white and pink wedding dress with a yellow bouquet in her hand, and that smile is guaranteed to light up any room she enters. rom Banpresto. 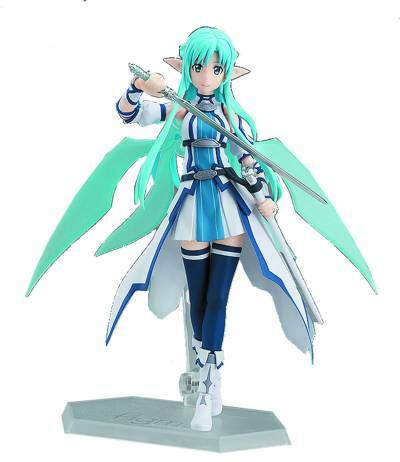 The sweet and beautiful Leafa has been captured by Banpresto for this EXQ Figure inspired by her appearance in Sword Art Online: Memory Defrag! Reaching a cute height of 5 1/8", she's depicted seated on the ground while stretching her arms for a charming design that'll put a smile on any fan's face. Who wouldn't want to run some dungeons alongside this brilliant player? From MAX Factory. 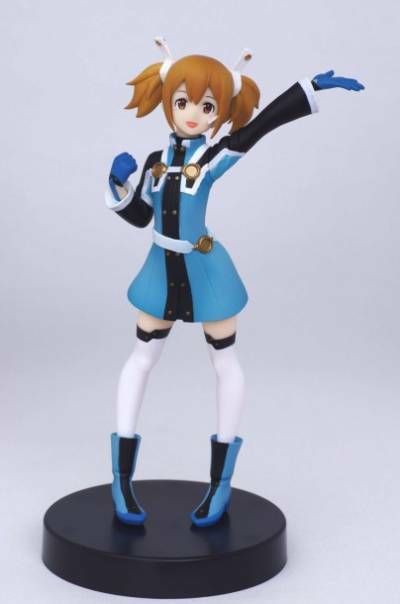 From Sword Art Online the Movie -Ordinal Scale- comes a figure of the AR idol character who made her debut in the film, Yuna! She features a lovely contrasting white and black color scheme, with lavender and blue shades in her flowing hair. Her outfit has been carefully sculpted to include the many details seen in the movie, and her pose captures the energy of her stage performances! From Chara-Ani. 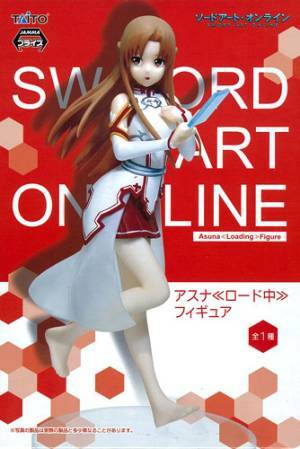 From Sword Art Online: Ordinal Scale comes this 1/7-scale figure of Asuna in her summer uniform! 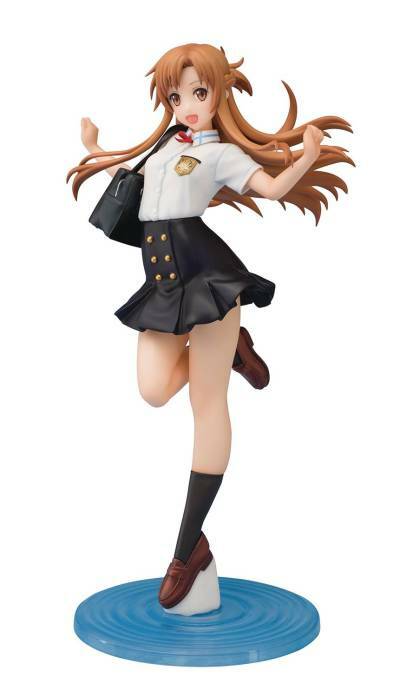 This bouncy figure features detailed sculpting on her hair and unique uniform for fans to enjoy! 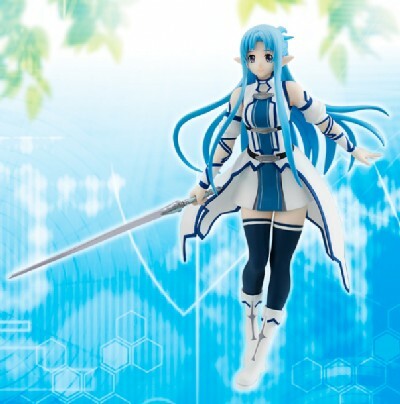 This Asuna stands about 8 1/2" tall and comes with a base for easy display. 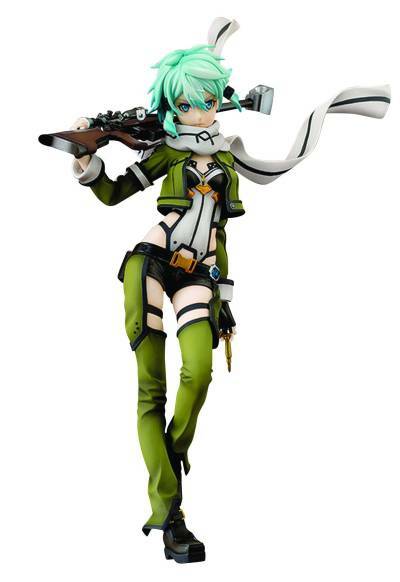 From the anime series Sword Art Online II comes a figma of Leafa, the avatar controlled by Kirito's younger sister Suguha! 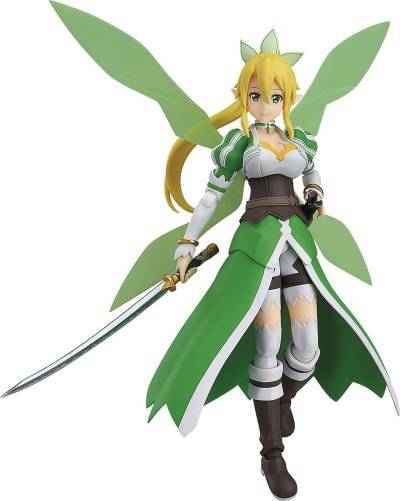 Leafa comes with three face plates (including a smiling face, a courageous shouting face and a cute embarrassed expression), optional parts such as her long sword, the medallion needed to obtain Excalibur, and articulated wing parts. 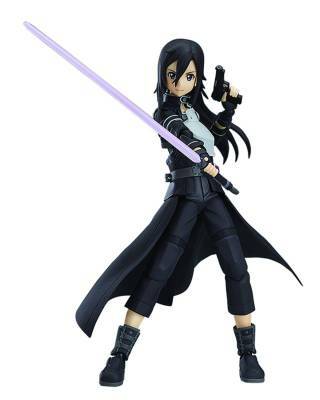 She also comes with holding hand parts to use with figma Kirito: ALO ver. to recreate their dance scene! From Broccoli. 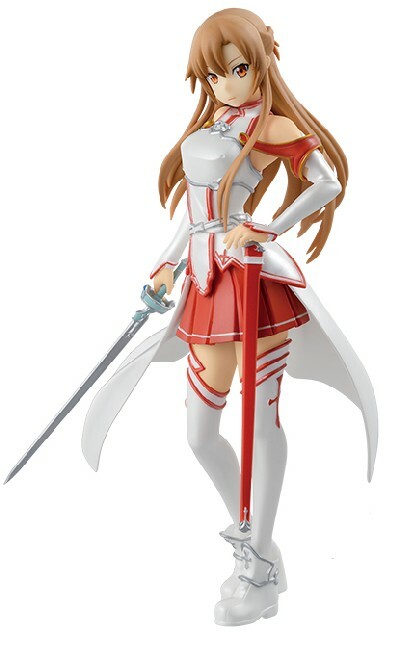 Asuna, the heroine of the hit light novel/manga/anime/video game series Sword Art Online looks surprised when her latest culinary creation lands in her lap after a tumble to the kitchen floor in this charming PVC figure that stands 4 3/8" tall. From Max Factory. 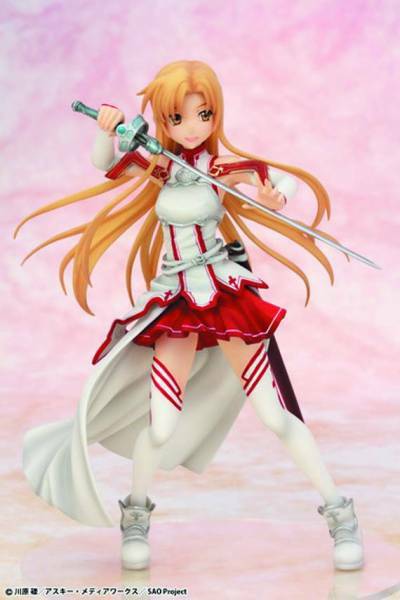 From the anime series Sword Art Online II comes a figma of the heroine known as the "Berserk Healer," Asuna, as her ALfheim Online avatar! Using the smooth yet posable joints of figma, you can act out a variety of different scenes. Her rapier is included as her weapon of choice, as well as the legendary weapon, the Crest of Yggdrasil. The included wing parts are not only articulated, but can also be attached and removed with ease. She comes with a gentle smiling expression, a shouting expression for combat and a confident grinning expression.